One of the first people to begin developing steam powered road vehicles was the French engineer Nicolas Cugnot in the 18th century. His designs, however, were developed not for civilian but military purposes, such as the towing of military equipment. 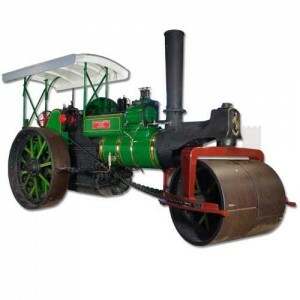 Over time the steam traction engine developed and expanded into other areas and types of vehicles such as road locomotives, steam tractors, ploughing engines,and steam rollers. This steam traction engine is an Aveling & Porter (Rochester) steam road roller. It has its original livery of green with red, gold and black piping, and was built in 1914. It was donated to the museum by Bishopston Community Council.